Authentic mud adobe Tucson Hacienda exquisitely finished throughout – a rare combination of stunning, historical ‘Old Presidio’ authenticity coupled with updated finishes in everywhere in the heart of Northeast Tucson. This 5 bedroom ‘gallery-like’ mud adobe Tucson hacienda is a masterpiece and features Solar panels for optimal energy efficiency. Famed artist, Thomas Blee Carlyle, painted floor-to-ceiling custom murals in every room. 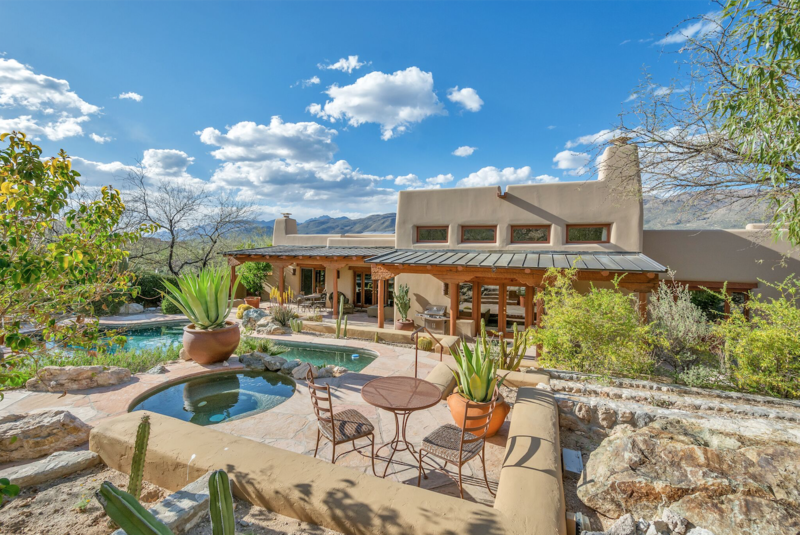 This mud adobe Tucson Hacienda epitomizes the essence of Tucson with its viga & plank high ceilings, a stunning yard oasis with a natural rock waterfall, fabulous pool and hot tub and multiple patios for entertaining in both the front and rear yards. Surrounded by this mud adobe Tucson Hacienda, you’ll be adorned with landscape with specimen cacti from the designers of “Plants of Distinction”. Enter the mud adobe Tucson Hacienda through a charming gated front courtyard centered by a generous fountain centerpiece a beautiful view of the Catalina Foothills Mountains. Enjoy resort living inside and out, with dual master suites, 4 fireplaces, a spacious 461 square foot gym/office/bonus room, versatile floor plan use, new exterior paint, and stunning detail in everywhere! This is a one-of-a-kind home that was featured in Tucson Lifestyle Magazine – very UNIQUE, special mud adobe Tucson Hacienda. This home was once listed for over $2 million. Take a WALK through this gorgeous mud adobe Tucson Hacienda on a 3D Tour now! Agua Caliente, literally meaning hot water, is a unique 101-acre park that features a perennial warm spring and pond that is home to an exceptionally rich mix of plants and animals. Agua Caliente Park has a long and interesting history with evidence of human habitation dating back about 5,500 years. Agua Caliente Park is considered a treasured gem in Tucson AZ and is known for birdwatching, picnics and a ‘hidden” escape for walkers, families, artists and tourists.